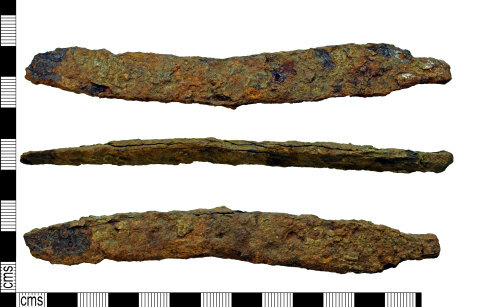 An incomplete iron knife blade of Post Medieval date (AD 1500-1600). The object has a tapering sub-rectangular blade and a whittle tang. The blade is sub-rectangular in section with a slight curve due to post-depositional processes. The tip of the blade and part of the tang are missing and the tip curves down slightly. The metal is a mid-brown in colour and is heavily corroded. Length: 136.33mm, Width: 17.36mm, Thickness: 7.55mm, Weight: 52.9g. Similar examples excavated in London and dated to the 15th - 16th centuries, although this style of knife is very common (Egan 2005: 90-91). Egan, G. 2005. Material Culture in London in an Age of Transition. MoLAS Monograph 19: London.